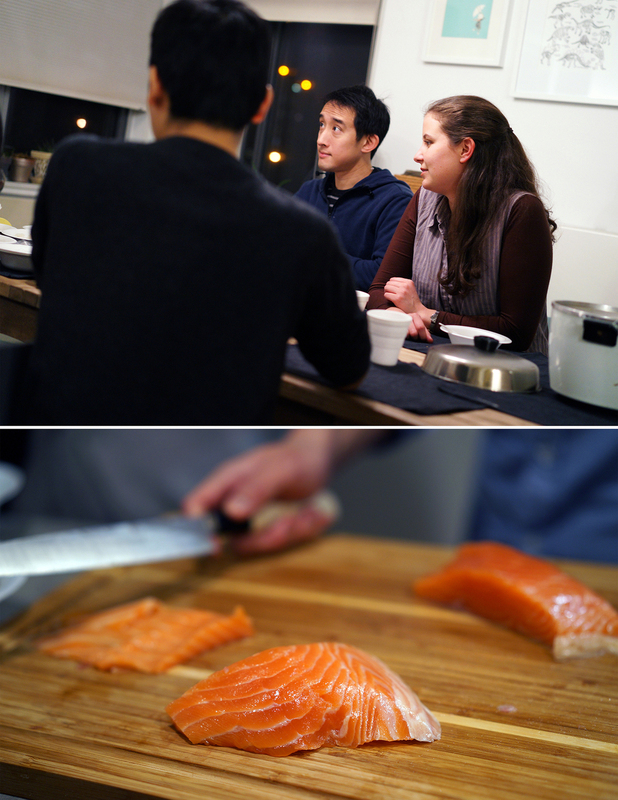 Last weekend, Rob and Jessica hosted Chirashi Night at their apartment for 16 guests to celebrate Rob’s birthday. After having many food adventures together in 2013, it was no surprise that they were flying in fresh fish from Catalina Offshore and preparing 16 bowls of heaven. I was skeptical about eating fish delivered from a website but after some research about the reputation and reviews of the website, I was sold. And, if anybody could pull off a successful chirashi night, it would be Rob and Jess. The menu: ahi, maguro, chutoro, scottish salmon, escolar, hamachi, unagi, uni, avocado, masago, ikura, poached egg, and tamagoyaki over sushi rice. Since nobody knew how to prep sashimi, Rob winged it. First, he removed the skin and bloodlines. 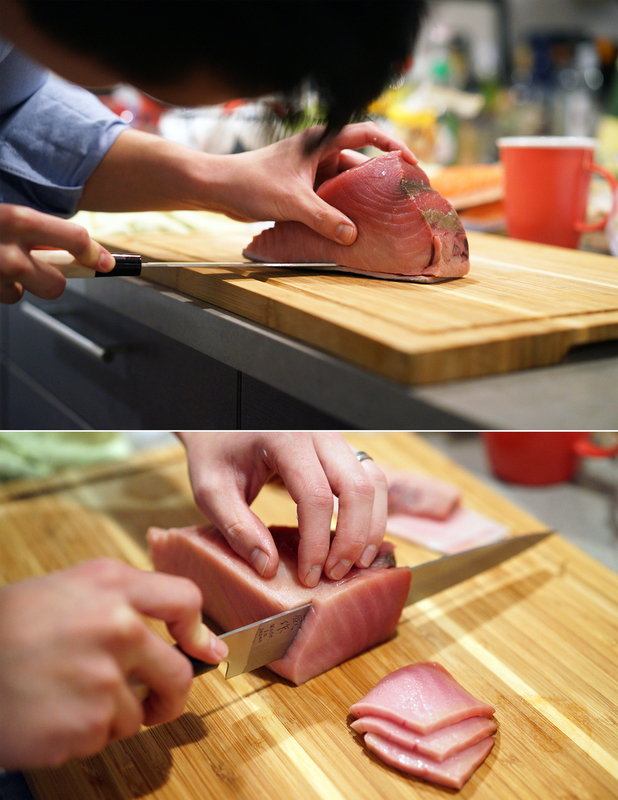 Then he started slicing the fish in a smooth downward motion. All the seafood was high quality and easy to cut. After a few pieces, Rob found his rhythm while the rest of us sipped on Jessica’s delicious miso soup with seaweed and watched, mesmerized. A highlight for me was meeting fellow foodies, Gabrielle Union and Aziz Ansari. Not only did they drop some knowledge about delicious hole in the walls in Queens, they are some of the nicest people ever. I am pumped about our upcoming dinner date at Bohemian. 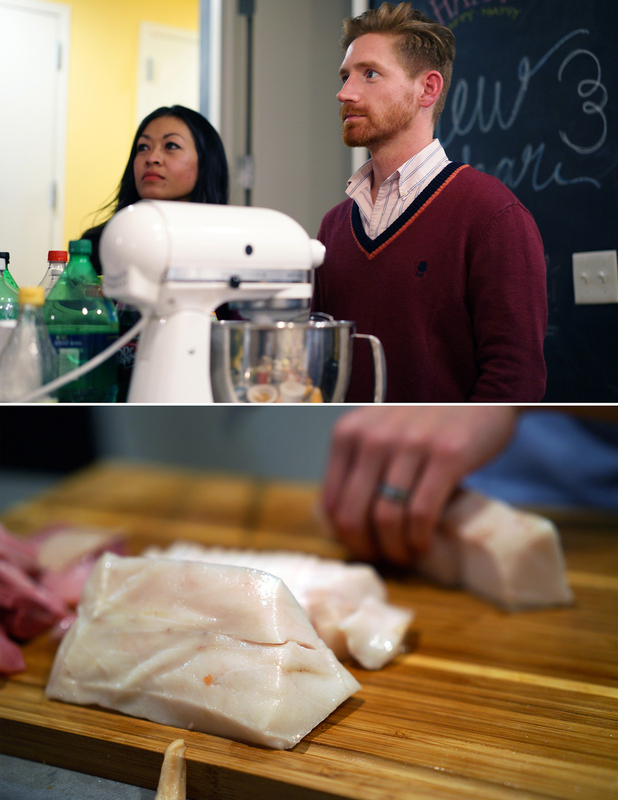 When Rob began to slice the escolar, everyone started joking about the known laxative-like effects and how the logistics would work for 16 people and 1 bathroom. After an hour and a half, all 7 pieces of seafood were sliced and ready to assemble. 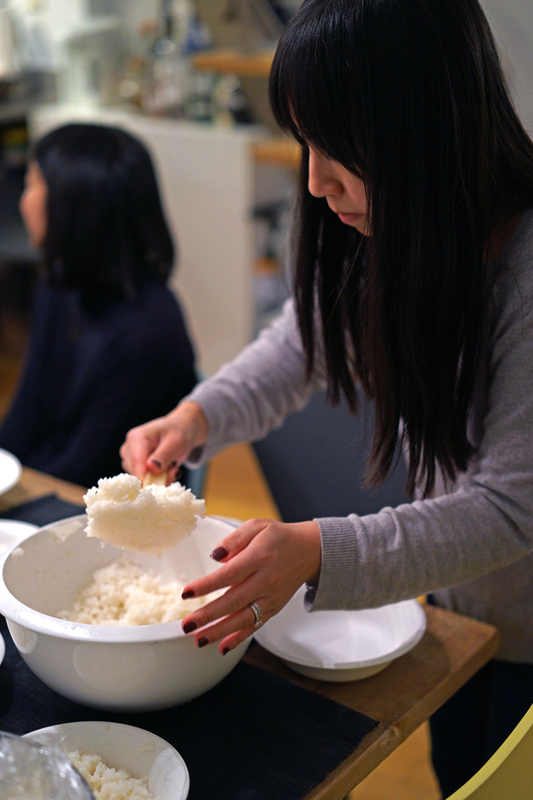 Jessica began portioning out the rice and filling them with a rainbow of fish with Grace’s help. Rob soon joined and the room was silent as we watched artists bringing their masterpieces to life, one color at a time. The dragon’s pupil took the form of a perfect egg that had been in a sous vide bath for 45 minutes at 143F and then gently poached. I poked my egg until the yolk dripped onto the roe below and into the crevices of the rice, coating everything with a lip-sticky puddle of lusciousness. 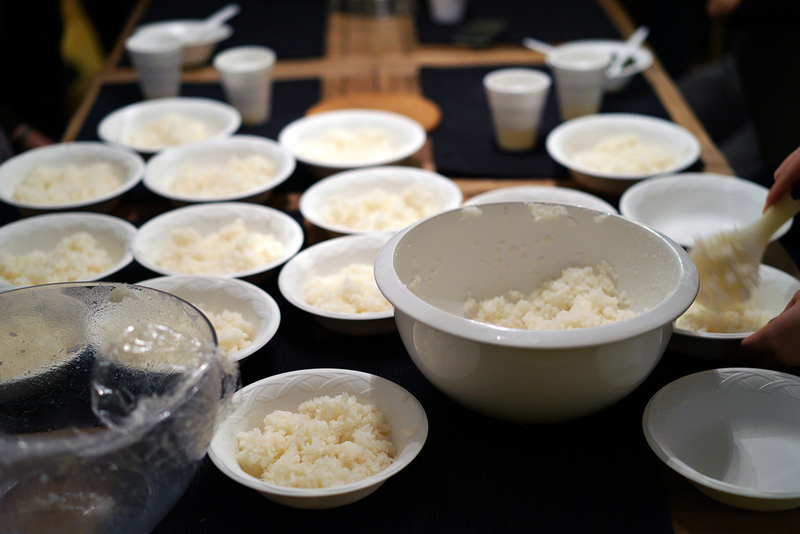 After adding soy sauce, green onions, and furikake to their bowls, people began to devour with oohs!, aahs!, and a few ermahgerds that occasionally broke the silence. My favorites: maguro, yellowtail, scottish salmon (the marbling made a big difference), and the delicious california gold uni which had a firmer texture compared to santa barbara. Next time, I’d like to order the amaebi (sweet shrimp) and hotate (scallops) if they are available on Catalina’s website. 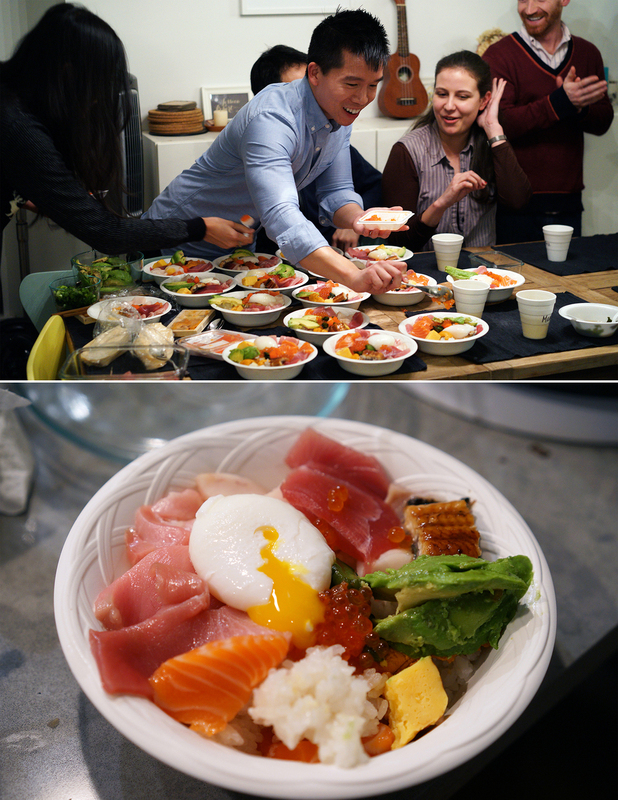 Overall a great experience and perhaps the start to a monthly Chirashi Night ritual. Some pointers to keep in mind after reading some articles: definitely wash the fish before slicing (oops) and slice across the grain at an angle (vs against the grain at a 90 degree angle). 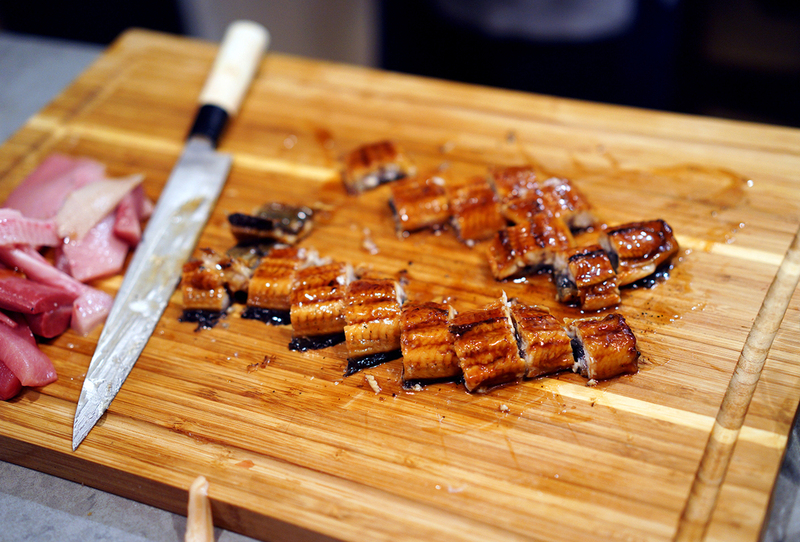 Don't get escolar even though it is delicious. There are plenty of other tasty fish you can order that won't cause WWIII. Read up on techniques and tips before you make your first slice. Wash the fish and slice at an angle across the grain. 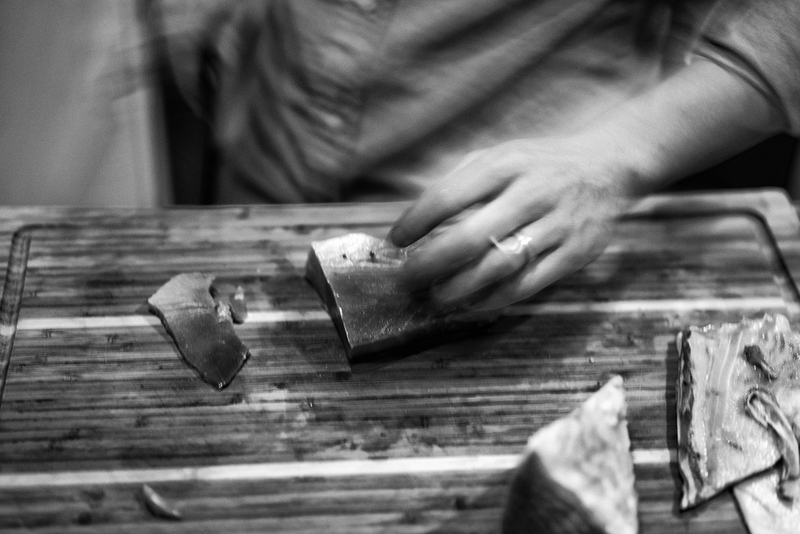 To cut down on prep time, get 2-3 people cutting with sharp Japanese steel. Get an assembly line of people to place the fish into the bowls. Poached egg is mandatory. 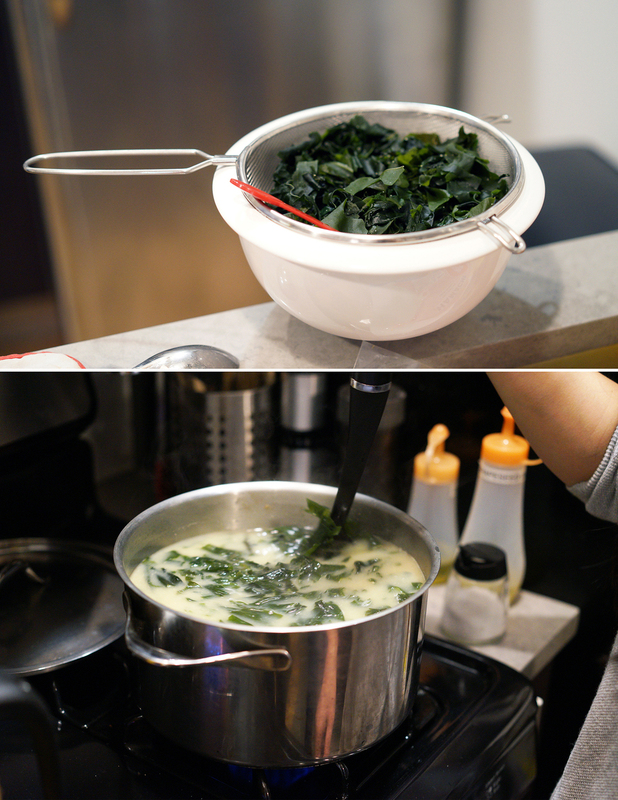 It binds the whole dish together and adds texture. Get a big group together if you're doing chirashi night. The cost for all the fish to feed 16 people was $320....best $20 spent ever.